The Divoom Voombox Party isn't the best sounding speaker we've heard, but the rugged build and portability might make it worth a look. It isn't the best sounding speaker, but if toughness and portability are more important to you than great sound, it might be worth checking out. People buy Bluetooth speakers for a lot of reasons, but one of the most common reasons is that they want to listen to music in places where they normally couldn’t. With that in mind, it’s surprising how many speakers really aren’t that portable, whether it’s due to size, weight, or just not being tough enough. When it comes to the Divoom Voombox Party, the speaker’s name reveals its intentions. Open up the box and see two things: the speaker and a box containing the accessories. Inside the box you’ll find a USB cable, 3.5 mm audio cable, and the manual. According to the Divoom website, the Voombox Party speaker comes in two colors: black and silver. Though the silver might be brighter, neither speaker looks particularly flashy by design. Then again, that isn’t the point here. What it lacks in terms of fun looks, the Voombox more than makes up for in the build quality department. Not only is the speaker IPX44-certified shock-proof and waterproof, but it just feels generally tough. Of course this does add considerable weight — this speaker feels much heavier than it looks. While most of the outside of the Voombox Party is taken up by the speaker grill on the front and back, the top, bottom, and sides are all covered in shock-absorbent rubber. You might get a few scuffs if you drop the speaker, but you can be fairly certain that it will still work. Pairing is a simple affair: turn the speaker on, press the Bluetooth button, then either pair from your device’s Bluetooth menu or tap your NFC-enabled device on the NFC logo on the side of the speaker. A covered 3.5 mm jack allows to connect your wired devices as well. Range is the standard 33 feet, and the Bluetooth 4.0 connection never dropped or stuttered as long as the speaker remained in range of the device. The speaker features five buttons on top to control the speaker’s own functions as well as playback. The power button and Bluetooth buttons are self explanaitory, while the call button controls not just speakerphone functions, but also pausing and resuming playback. Tapping the + and – buttons raises and lowers volume, while holding them down skips forward and backward, respectively. Call quality was good when using the Voombox fo. See the Sound Quality section below for more information, but incoming calls sounded decent and outgoing voice was loud and clear, as long as the person speaking remained fairly close to the speaker. Divoom claims a battery life of up to 8 hours for the Voombox Party. In a rare change of pace, we actually got a little closer to 9 during testing. It isn’t often we see a speaker surpass the manufacturer’s estimate, especially during our testing process, but it’s always welcome. Our charge time was roughly two hours using a generic wall charger. Divoom doesn’t include a wall charger with the Voombox party, so we can’t provide a definitive statement on charge time. The Voombox Party crams a lot into its small exterior: you’ve got a pair of 2″ full range drivers, two passive radiators, and a 3″ speaker that Divoom refers to as a subwoofer. We’re dubious when anything that small claims to be a subwoofer, and in this case it seems we were right. Bass is certainly present here, but it’s boomy and generally not very accurate. Sub-bass is noticeably absent, which isn’t surprising given the form factor. Most of the low frequencies you’ll hear are 100 Hz and higher. Lower mids are somewhat subdued, and a lot of the midrange frequencies sound strangled. There seems to be a boost in the 800 – 1000 Hz range, with higher mids sounding more muffled or rounded off. Highs are the same strange mix of muffled and very present. Hi hats and certain cymbal details came through loud and clear, but many more high end detail seemed to be lost in the shuffle. While it does a good job of sounding bigger than it actually is, the speaker sounds like someone threw a blanket over a much better speaker. This is a common issue we see with “rugged” speakers. The seals necessary for IPX44 certification do a great job keeping water out, but they adversely affect the sound in the process. Volume gets fairly loud, though we’ve heard plenty of speakers in the same price range that do get louder. If you’re taking this to the park, you’ll be fine, but don’t expect it be your sole source of entertainment to keep a house party going. 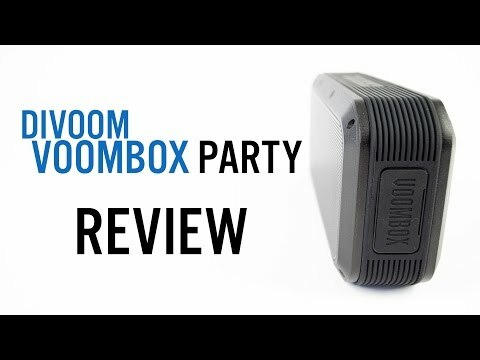 While the sound suffers from the same issue that many rugged Bluetooth speakers face, the Divoom Voombox Party is priced lower than many of its competitors and that proves to be an advantage. While it lists at $149, at the time of this writing the speaker is available at a few online stores for just $99. That low price doesn’t do anything to improve the sound quality, but if the IPX44 rating and portability factor are important to you, it’s worth checking out.